The main advantages in using composites and in particular those reinforced with carbon are light weight with high stiffness, tensile strength and compressive strength. 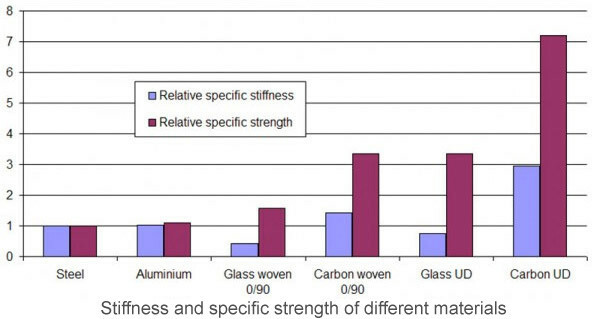 The following graph shows the merits of composite materials when compared to steel and aluminium in terms of stiffness and strength at equal weights. 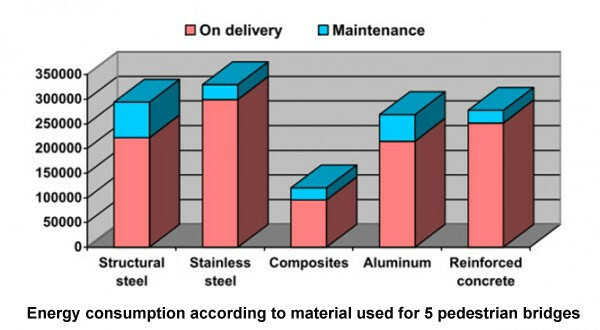 Below is a comparative table illustrating different parameters for some commonly used materials and composites. A specific characteristic of composite materials is their plasticity, or the ability to be shaped into any desired form. With composites, one can make an almost unlimited number of products of any shape and dimension while using fewer parts. The designer can mold the material to suit the shape and function of the finished product without the rigid constraints imposed by metal and wood carpentry. 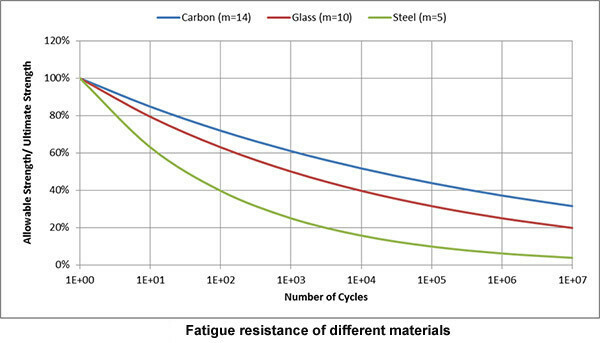 A further special mechanical quality of composites is that of greater resistance to fatigue compared to more common construction materials. A chemical-physical characteristic of decided relevance to composite materials is their resistance to corrosion and aggression from environmental agents, resulting in a substantial reduction or even elimination of maintenance costs and longer longevity for the finished product. Last but not least, a particularity of composites is their light weight: the lower weight when compared to traditional materials results in cost advantages for storage, transportation and installation. Products of this type require fewer parts to assemble with attendant generalized savings in the manufacturing process. Energy use decreases substantially as a consequence, making composites decidedly more eco-sustainable when compared to traditional materials. The chart below illustrates the energy required to build and maintain some five pedestrian bridges in relation with the material employed.